As a pup, Cubby was taken from the streets of Detroit and brought to the Humane Society. A loving, dedicated black lab mix, he was a natural fit to be a service dog. Though too hyper to work as a leader dog for the blind, Cubby soon found his natural talent as a police K-9. 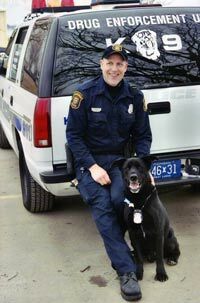 He was matched up with New Baltimore Police Officer Tim Lindstrom, and the two trained at the Oakland Police K-9 Academy, where Cubby developed a talent as a narcotics dog. 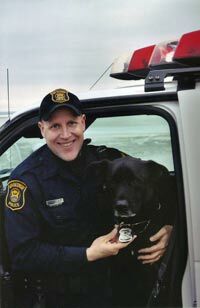 After graduating in 1999, Cubby and Officer Lindstrom returned to New Baltimore, where they worked in tandem for nearly five years. In that time, Cubby assisted in 290 narcotic arrests, searched countless vehicles, and kept schools across Macomb and St. Clair drug-free. He loved performing demonstrations, coming alive before an audience. 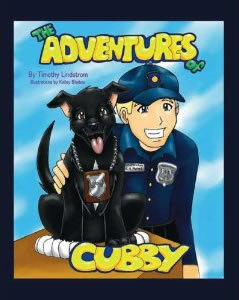 In August 2003, Officer Lindstrom found a tumor on Cubby’s right side. Surgery was scheduled, and within a week, fifteen more tumors showed up. They removed them. Fifteen more showed up, and Cubby was in trouble. After additional tests showed widespread cancer, the New Baltimore Police held a dinner in Cubby’s benefit. The community outpouring of support was overwhelming: nearly 1,000 citizens showed up for the benefit dinner. People knew how much Cubby had helped the community, and they wanted a chance to help him. Cubby’s spirit lives on in the impact he had on others, the safe schools he helped protect, and the happiness he spread.